River Counties Community Foundation celebrated and honored the work of local nonprofits at its annual grant reception on Monday, July 9. Over $550,000 in competitive grants were awarded within a framework of cultural vibrancy, health and wellness, educational success, and economic prosperity. River Counties Community Foundation celebrated and honored the work of local nonprofits at its annual grant reception on Monday, July 9. Over $550,000 in competitive grants were awarded within a framework of cultural vibrancy, health and wellness, educational success, and economic prosperity. The focused areas collectively work toward a better quality of life for all residents in Lancaster, Northumberland and Middlesex counties. In a rural area, it is important that residents, young and old, have access and are exposed to high-quality arts and cultural opportunities. Grants to Northern Neck Orchestra and Rappahannock Foundation for the Arts will bring those performances to life on local stages. Rappahannock Concert Association and The Court House Players work directly with youth to provide string instruction and summer theatre camp. RCCF supports organizations providing access to the wealth of historical assets in our community. Expanding hands-on exhibits and engaging visitors, Historic Christ Church, Steamboat Era Museum, and Rice’s Hotel/Hughlett’s Tavern all are focused on making history come alive for its visitors young and old. The foundation invests in services which ensure community members are safe and healthy. Grants to Northern Neck-Middlesex Free Health Clinic and the Ledwith-Lewis Free Clinic provide primary care and wellness visits for un- or under-insured adults. And understanding the importance of healthy foods for all, Healthy Harvest Food Bank is building a new warehouse to store and distribute foods more efficiently and provide added educational programs. Awards to Upper Lancaster Volunteer Rescue Squad, Fairfields Volunteer Fire Department, and Smith Point Sea Rescue will support equipment upgrades to ensure the best response to emergencies to keep the community safe. To best support the health of at-risk populations, Three Rivers Health District will use grants funds to work to train residents as part of the Medical Reserve Corp, and provide outreach and education on responding to the opioid crisis. Assisting victims of domestic violence, Avalon Center on the Middle Peninsula and The Haven on the Northern Neck, provides counseling, advocacy and shelter for women and children. When children are involved in abuse and neglect cases, Northern Neck CASA is their advocate. Grant funding to send volunteers to attend the National CASA conference increases their ability to serve our youngest. RCCF is committed to the health and wellness of all children, and supports the need for upgraded and redesigned facilities at Dream Fields in Kilmarnock. Further promoting physical activity and healthy living, Middlesex Family YMCA’s 7th grade initiative program will include transportation home through a grant focused on providing access to all children. From children to seniors, health and wellness touches every resident. Working with individuals suffering from Alzheimer’s, Rappahannock Westminster-Canterbury Foundation and the Alzheimer’s Association provide respite care hours and scholarships for eligible families through their grants, allowing a small break for the caregiver from what is coined the 36-hour day. And knowing the community health benefit from fewer stray animals, the Animal Welfare League provides spaying/neutering services for the feral cat population through funds that support the four-legged residents. The Foundation’s goals around educational success aim to ensure that all children achieve in school, engage in their community, and are prepared for the workforce. Grant funding to the Kiwanis Club of Middlesex will expand its partnership with the Middlesex County Public Schools to provide service based projects and opportunities for students. And knowing all children must be ready with the supplies and clothing they need, RCCF assists the Northumberland Family YMCA Bright Beginnings program, held each summer. Focused on each student’s K-12 pathway, Lancaster County Virginia Educational Foundation was awarded a grant to create two new FIRST LEGO Robotics teams at LMS to help feed into the high school team. Further expanding STEM enrichment, RCCF supports the Northern Neck YMCA as it morphs its traditional after-school programming to incorporate drones, coding, leadership and construction. And Friends of the Rappahannock will expand its work at St. Clare Walker Middle School to provide both students and teachers a deeper dive into conservation through the Foundation’s grant. Engaging teens and understanding this crucial window of time for development, RCCF is making investments in the Boys and Girls Club of the Northern Neck’s facility expansion for dedicated teen space and revamped programming, and the Lancaster Community Library’s upgraded teen space and programming. Grants to GRASP will allow for one on one guidance for students and families at Lancaster and Northumberland High Schools in the FASFA process, especially our first-generation college students. Middlesex County Public Schools moved from concept to reality, through a multi-year grant from the foundation, to create the Compass Academy. Opening in the fall, the academy will create a progressive alternative setting for students who are unable to be success in the typical school setting, providing the opportunity for all student to reach their full potential, regardless of barriers. The Foundation awarded grants for summer programming, decreasing the risk of students sliding backward between school years. Jacob’s Ladder engages youth in grades 4-8 identified as intellectually gifted, but at-risk through a summer residential camp, and MACorp’s Girls Empowerment Camp and Camp SWAG (for boys) guides youth ages 12-18. Middlesex County Public Library will bolster its summer reading and programming for all youth through RCCF support. A critical part of building a strong, vibrant community is safe, stable and affordable housing for all residents. Major investments have been made to organizations who are working to build new or repair old homes in our community. The Middlesex Foundation was granted a multi-year award in 2017 to plan and develop the concept of an affordable apartment community in the Cooks Corner, modeled after Mercer Place in Lancaster. Grant funds are now leveraging state funds to move toward construction. Habitat for Humanity of Middlesex and Hands Across Middlesex work closely together on housing. Habitat has purchased its first large tract of land and an award from RCCF will provide development and infrastructure for the future build of 6-7 Habitat homes. Working with a housing stock that is aging, support for Hands’ home repair program provides materials needed for volunteers make living conditions safer and healthier. In similar partnership Lancaster/Northumberland Habitat for Humanity and Lancaster/Northumberland Interfaith Service Council provide housing support in the lower Northern Neck. Grant awards to Habitat will support its first custom modular build with Chesapeake Homes in Northumberland, and Interfaith will continue to provide home repair and ramp construction for those physically or financially unable to make these improvements on their own. Understanding the need to prevent homelessness, RCCF has invested in the start-up and continuation of Middlesex Department of Social Services’ Rapid Re-Housing Program. Wrap around services, coupled with rental assistance, provide short and long-term solutions and follow up for those in crisis. Ultimately, self-sufficiency of residents is the goal of all service organizations. Grants to Legal Aid Works provides an outreach paralegal to look at the long term financial needs of eligible clients in the Northern Neck who should be receiving Social Security Disability, and works to advocate on their behalf, and VersAbility Resources provides employment as a means of financial support for adults with disabilities at the Puller Center. Investments in infrastructure are part of ensuring a strong community that provides all residents the opportunity to move up the economic ladder. Transportation remains a challenge. Funding from RCCF, coupled with local governement dollars, allows Bay Transit to operate a second bus in Middlesex to get residents to work or other appointments. To provide better access to internet, the Foundation helped put Northumberland Public Library’s Mobile Library on the road, which provides outreach to underserved areas of the county and broadcasts a strong (and free to the public) wifi signal. “The nonprofit sector plays a crucial role in all four focus areas that make a strong and vibrant community. River Counties Community Foundation remains committed to support local organizations as they take the lead in implementing new and expanded services to meet the needs of all residents,” said Bill Vose, RCCF Board Chair. The power of endowment has resulted in a growth of RCCF to nearly $17.5 million in assets over the past 20 years, while resulting in the investment of over $8 million in community nonprofits. “It has been powerful to have worked 10 or more years ago with donors in establishing funds and now being able to see the impact their funds are making. Their names and their philanthropy are living on long after they are gone” said Margaret Nost, Regional Director. Established in 1996, River Counties Community Foundation stewards charitable endowments for donors, partners with nonprofits through grantmaking, and provides leadership on community issues. For further information on the work of RCCF, visit www.RiverCountiesCF.org or call Margaret Nost, Regional Director, at (804) 436-1600. Thanks to a $3,000 grant from the River Counties Community Foundation, an affiliate of The Community Foundation Serving Richmond & Central Virginia, GReat Aspirations Scholarship Program, Inc. (GRASP), a college access organization, can continue its financial aid services and mentoring to students at Lancaster and Northumberland High Schools for a fifth year. GRASP, a Virginia non-profit, implements its services via advisors who provide free, confidential, one-on-one counseling to students seeking financial aid and scholarships for continuing education after high school – whether that is at a technical school, community college or a four-year university. GRASP advisors now serve students and families in 76 Virginia schools, from the greater Richmond area, to Highland County in the west, to Lancaster County in the east, and to Sussex County in the south. The highly trained, GRASP advisors are adept at navigating the maze of the college and post-secondary education financial aid process. They also have a passion for helping today’s youth grasp infinite opportunities. During the 2017-2018 academic year, GRASP advisors met with 122 students individually at Lancaster and Northumberland High Schools, helping them with their plans for education after high school. Additionally, GRASP awarded five Last Dollar scholarships totaling $3,000 and four “2+2” scholarships (for students planning to attend a community college and then transfer to a four-year college) totaling $4,000 to students at those schools, providing additional financial assistance toward their educational goals. River Counties Community Foundation (RCCF) announces the 2019 Advisory Board Officers and appoints three new board members to three-year terms. 2019 officers are: Mary Kay Rotert, Chairman, Carolyn Norton Schmallenberger, Vice Chairman, Bill Vose, Secretary and Mason Brent, Treasurer. With nine years of service, Ron Mihills and Debbie Newman retired from the Board. “Ron and Debbie served with great energy. We thank them for their dedicated and valuable contribution to our community,” said Bill Vose, departing Board Chair. Newly appointed board members are: Middlesex County residents, Wayne H. Jessie, Sr. and David R. “Jerry” Suyes, Jr. and Lance Franke from Lancaster County. RCCF seeks to align its giving in Lancaster, Northumberland and Middlesex Counties with carefully identified community needs. RCCF’s success is enhanced by knowledgeable advisory board members. Wayne Jessie was elected to the Middlesex School Board in 1996; subsequently, elected to the Middlesex Board of Supervisors. He is also a representative to the Middle Peninsula Planning District Commission and Middle Peninsula Alliance, serves on the Urbana Oyster Festival Foundation Board and the Middlesex Sports Complex Committee. He is a member of the Middlesex Volunteer Fire Department, American Legion Post 241 and Mt. Zion Baptist Church. J. Lance Franke retired from Sallie Mae as Executive Vice-President of Finance. Previously, he worked in management consulting for Macro Systems, Inc. and in sales for Xerox Corporation and Exxon Office Systems. Franke has served as Treasurer of the Chesapeake Academy Board of Trustees in Irvington and is currently a Trustee. He is also a member of the Rappahannock River Yacht Club where he chaired the Long-Range Planning Committee. Dr. David “Jerry” Suyes, Jr. practiced dentistry for 55 years with an office in Richmond and a satellite office in Middlesex. Suyes is a Past District Governor for Rotary International, served as President of the YMCA of Richmond and is a founding member of the Middlesex YMCA. “I became familiar with RCCF when the Church of the Visitation in Middlesex created an endowment fund. Since its establishment, the fund has provided more than $20,000 in college grants to Middlesex County students. That’s how I learned about creating a legacy”, said Suyes. For information about establishing a legacy fund, call RCCF Regional Director Margaret Nost, 804 436-1600. RCCF’s annual fundraising campaign, Together.Stronger., is now underway. This campaign allows RCCF to aggregate smaller gifts in a manner to achieve maximum impact, providing support for unmet needs and emergency situations. Contributions may be made electronically at www.RiverCountiesCF.org or by check, mailed to P.O. Box 222, Kilmarnock, Virginia 22482. IRVINGTON—River Counties Community Foundation (RCCF) presented its "2015 Report to the Community" at a recent event honoring board members, donors, and friends at the Steamboat Era Museum. 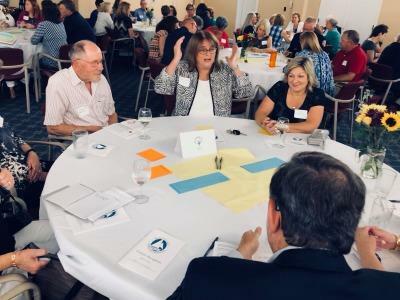 "Over $340,000 was awarded this year to nonprofits serving Lancaster, Middlesex and Northumberland counties," said advisory board chairman Susan Pittman. "This is an increase of 18% from 2014." Community grants awarded by RCCF focus on economic prosperity, educational success, health and wellness, and cultural vibrancy. "In addition to the increase in grant-making, three new funds have been established this year, bringing the total funds managed by RCCF to nearly $10 million," said regional affiliate director Margaret Nost. "It has been a busy and successful year," Pittman added. "In addition to the community grants program, RCCF actively supported local organizations during the 2015 Amazing Raise in September and is currently rallying support for Together.Stronger., our annual fundraising campaign." Together.Stronger. received considerable support in 2014 from donors recognizing the importance of philanthropy in the community, she said. Nonprofit organizations fill a crucial role in creating a healthy community, and greatly need support. Advisory board members Jay Wallin and Gene Mapes will end their terms this year. Both were recognized for their outstanding service and commitment. Nearly half of all competitive grantmaking in 2016 focused on economic prosperity, including access to and maintenance of safe and affordable housing, pathways to self-sufficiency, and access to career opportunities. Major investments in this sector included transportation through expanded Bay Transit services in Middlesex County and an increased capacity for VersAbility Resources, serving working adults with special needs in the region. Believing that educational success is important for all residents, RCCF invested over $90,000 in early childhood education and school readiness, supportive school environments, out-of-school enrichment, and youth workforce programming. The River Counties Youth Fund, one of several funds that contribute to the competitive grants, supported Summer Slam Camp at Dream Fields in partnership with the Northern Neck YMCA and VCU, and CareerLaunch and Money Matters programming through the Boys & Girls Club of the Northern Neck. Over $140,000 was focused on ensuring residents have access to preventative services and quality health care. Support to Hospice Support Services of the Northern Neck provided expanded outreach in Northumberland and Lancaster counties, and funding to the Northern Neck-Middlesex Free Health Clinic focused on access to dental health services throughout the three-county region. RCCF also supports non-profits that provide access to and appreciation for arts and cultural opportunities. Grants to Rappahannock Art League and Arts in the Middle included strategies for increased exposure to diverse audiences through targeted outreach. Irvington, VA – The River Counties Community Foundation Advisory Board (“RCCF”) presented its annual Report to the Community at a reception at the Steamboat Museum on November 15, according to RCCF chair Bill Vose. The reception was a celebration of RCCF’s 21 years of service to the residents of Lancaster, Northumberland and Middlesex counties. This year’s report, highlighted by its cover, shows oysters as a metaphor for RCCF. Similar to the power of many single oysters in a reef, the Foundation aggregates component funds and the Together.Stronger. annual giving program to target and respond to changing needs in the community. “The more we come together to financially support philanthropic needs – the bigger our reef – the better we are at making lasting change in our community,” shared Vose. The River Counties Community Foundation Advisory Board (“RCCF”) presented its annual Report to the Community at a reception at the Steamboat Museum on November 16, according to RCCF chair Susan Pittman. The reception was a celebration of RCCF’s 20 years of service to the residents of Lancaster, Northumberland and Middlesex counties. The report highlights the outstanding progress made by the foundation in its annual disbursements for philanthropic purposes. In the founding year, 1997, the foundation made competitive grants of $1,500 to three nonprofits. This year, more than $1,000,000 in total grants was available for investment in a variety of important nonprofits. The officers for 2017 were introduced at the meeting. They are William O. Vose, Chair; Mary Kay Rotert, Vice Chair; Brownie Watkins, Secretary; and Martha Heric, Treasurer. Two departing members of the Board, Mary Lib Hoinkes and John Coyle were recognized and thanked for their many years of service.